Rocketeers led by Johns Hopkins University astrophysicist Stephan R. McCandliss today launched the most sensitive instrument they’ve ever used to explore outer space, seeking clues to how galaxies grow with the birth of new stars, and how they stop growing. Hours before dawn on Friday they fired a 58-foot unmanned rocket from the White Sands Missile Range in New Mexico more than 170 miles up for a brief but clear look at the Great Barred Spiral Galaxy. Using an onboard spectrographic telescope built at Hopkins, the McCandliss teamrecorded ultraviolet light observations of hydrogen gas, the main fuel of star formation, that surrounds the galaxy. The parabolic flight lasted about 15 minutes from liftoff to the time the rocket parachuted back to Earth. That gave the telescope containing an intricate array of tiny light-admitting shutters about six minutes above the Earth’s atmosphere – where light from the far ultraviolet light end of the spectrum is not filtered out — for a clear view of the target galaxy 56 million light years away. The rocket flight was part of NASA’s Sounding Rocket Program, which supports about 20 missions a year, exploring space at relatively low cost. With NASA’s support, McCandliss and his rocketry team at Johns Hopkins took about six years through early 2013 to build the $3.2 million telescope launched on this flight. FORTIS is the most sensitive instrument the group has ever used for a couple of reasons. The instrument’s array of light-reflecting mirrors “bounces” the light only twice, meaning less light is lost before it reaches the telescope’s detector. FORTIS also can simultaneously target and record many spectra from several targets automatically. This was the third FORTIS mission, and promised to return the most useful information. In two previous attempts in 2013 – one aimed at observing a different galaxy, another targeting the Comet Ison — technical problems affected the quality of the information returned. Each mission, however, achieved enough to be considered a substantial success. This time, McCandliss said it all appeared to have worked as planned. “We got data, we got spectra,” said McCandliss, adding that there was still a lot of information to be downloaded from the instrument. He said a couple of grids used to filter out charged particles were lost, but that did not appear to have compromised the information collected. The rocket launched right on schedule at eight minutes to midnight New Mexico time, soaring into the darkness at a top speed of about 5,100 miles an hour. After separating from the motor, the payload section carrying FORTIS continued the ascent, reaching a high point of about 173 miles – a zone between the range of weather balloons and satellites. 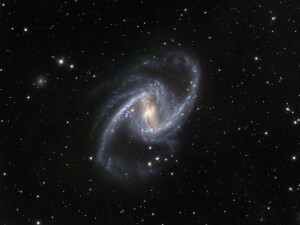 FORTIS sent down a stream of information about the light from bright spots in the spiral arms of the galaxy being fed by gas flowing in from the surrounding circumgalactic medium. That’s the region showing significant gas ebb and flow – the activity that feeds star formation. It will take months to analyze the information, potentially adding to scientists’ understanding of how galaxies sustain themselves and what causes them to stop producing new stars. The team’s hypothesis is that ultraviolet radiation from new stars temporarily stifles star formation, regulating the rate at which stars form. The FORTIS spectrographic element splits the light captured by the telescope into segments of varying wavelength intensity, which help scientists discern hydrogen emission and absorption. McCandliss, who now has completed 17 sounding rocket launches since his first in 1989, has co-written a number of published papers based entirely or in part on information collected on these missions. He said two of the most cited papers involved observations of a nebula in the constellation Orion, and of the Comet Hale Bopp. McCandliss hopes that the success of the microshutter array in a far ultraviolet application will qualify its use on larger orbital missions, such as a newly conceived ultraviolet/optical High Definition Space Telescope (HDST), which was proposed this summer by an international consortium called the Association of Universities for Research in Astronomy. Planned as larger and offering images many times sharper than the Hubble Space Telescope, the HDST could be used to study relatively near Earthlike planets for signs of life.